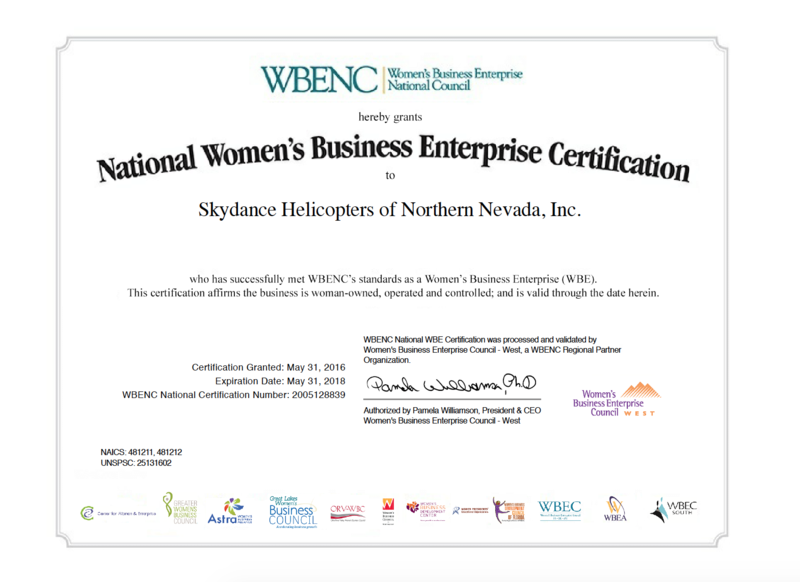 Skydance Helicopters is proud to announce their official certification of Woman-Owned Small Business by the Women’s Business Enterprise National Council. Skydance Helicopters. is pleased to announce the launch of their new Website. The site was designed and developed by Reno based Laxalt & McIver. 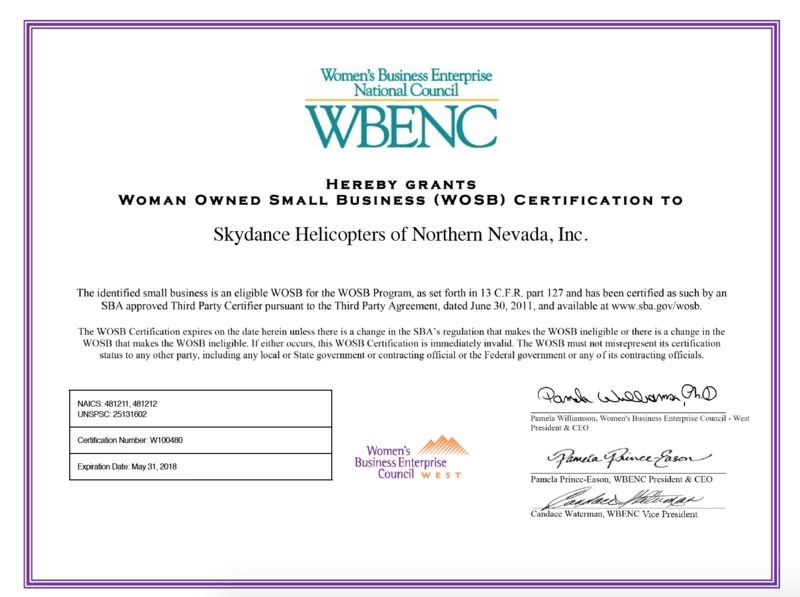 In business over 30 years, Skydance is one of the oldest and most experienced helicopter companies. 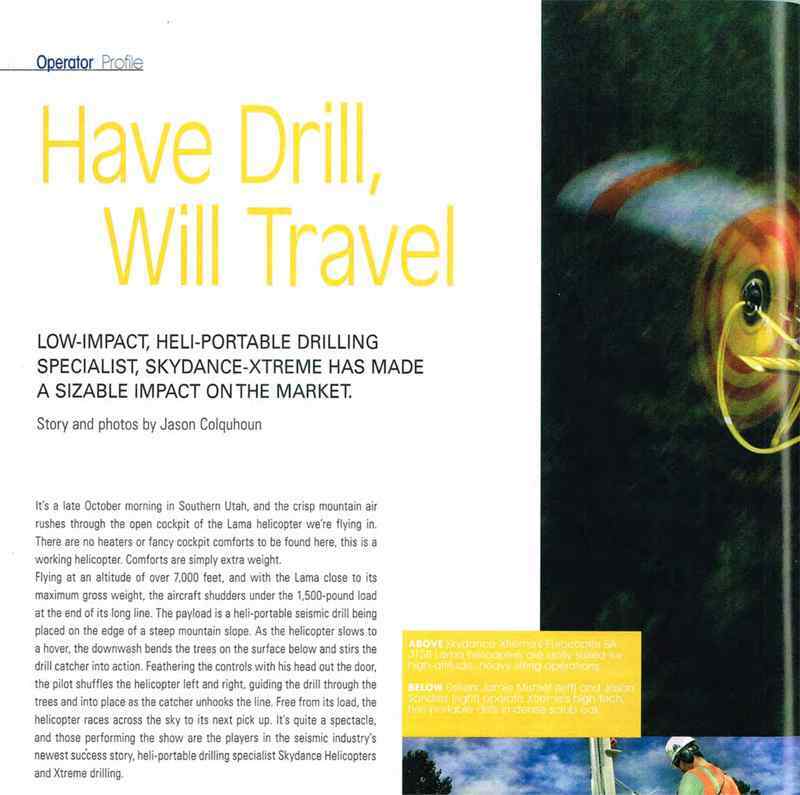 Skydance offers an exceptional safety record as well as a courteous and professional support staff. “L&M is dedicated to creating disruptive, game-changing marketing communications that energize and transform brands and create engagement with their audiences. We are excited to bring our capabilities to Skydance Helicopters and provide them with a dynamic new Website as they continue to build on more than three decades of aircraft service innovation ”. The United States Forest Service (USFS) is ready to launch its new emergency medical short-haul program — marking the first time the agency will have the capability to conduct its own helicopter short-haul evacuations of injured firefighters and other personnel. Members of USFS helitack crews based in Jackson, Wyo., and Wenatchee, Wash., gathered in Montana last week to undergo initial training for the program, which is modeled after existing National Park Service (NPS) short-haul rescue programs. That training followed a “train the trainers” session in late April, during which leaders in the program fine-tuned operating procedures and terminology. 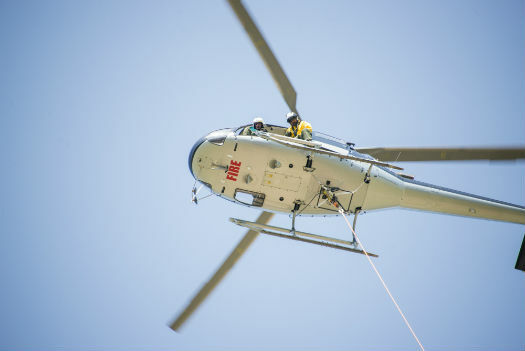 In the short-haul technique, rescuers and victims are flown at the end of a helicopter’s long line, enabling rapid evacuation of patients from areas — such as in tall timber — where helicopters are unable to land. Previously, the USFS has relied on NPS crews to provide the capability on major wildfires, but coverage has necessarily been limited. “We don’t foresee this being used often, but the capability is out there,” said USFS short-haul specialist Seth Weber, speaking to media last week during a training day at Nine Mile Airport near Missoula, Mont. During the inaugural, 2015 season, only the Jackson and Wenatchee helitack crews will have short-haul capability, using Airbus Helicopters H125 (AS350 B3) aircraft operated by Helicopter Express and Skydance Helicopters, respectively. Short-haul crews will consist of an appropriately qualified pilot, spotter, and short-hauler, who will undergo proficiency training at least every 21 days. Operations will be conducted only during daytime visual flight rules (VFR) conditions. 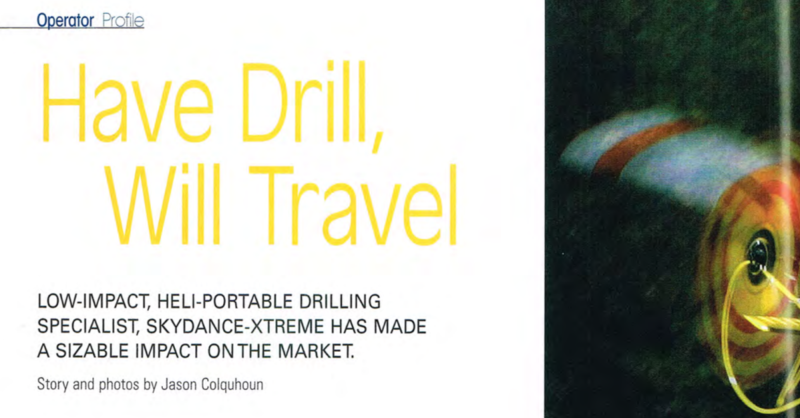 Mission equipment is standardized and includes Priority 1 Air Rescue Dyneema short-haul lines; Air Rescue Systems line ballasts and Heli-Bridle systems; Metolius Ultimate Daisy tether attachments; and Bauman short-haul bags and Screamer Suits. Both spotters and short-haulers will use the Yates 388 Heli-Ops harness. According to USFS equipment specialist Kevin Brown, equipment was selected following a tour of NPS short-haul programs last summer, which gave the Forest Service the chance to compare and select the materials and methods best suited for its needs. “I think we’re in good shape, especially based on what our mission will be,” said Brown, noting that medical evacuations of firefighters will likely take place under different circumstances than many of the technical mountain rescues conducted in National Parks. He added, however, that the USFS plans to retire all textiles and tethers at the end of this season, and subject them to additional verification testing. “We’ll look at how [the equipment] was used and what damage we see,” he explained. In addition to equipment testing, the USFS will conduct an operational evaluation of the program’s first season, which will determine how the program is modified — and expanded — in years to come.